In March we had 12 Scouts taking part in the March March event organised by South Brent Scout Group. This involved over 70 Scouts and consisted of a hike from South Brent Village Hall, up on to Dartmoor, and then to a wild camping spot. We all walked in small groups of 6 or 7 Scouts – mixed up with different troops – carrying our overnight gear. The tents, food and cooking stoves had been left at the camping spot so upon arrival at 4pm the Scouts pitched their tents and cooked their evening meals. 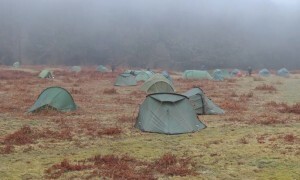 A dry, chilly day was followed by a quiet night and then a wake up in the fog, mist and light rain on Sunday morning. 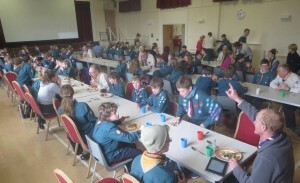 After clearing the site we then hiked back to South Brent for a wonderful three-course Sunday lunch at the Village Hall.